We hold expertise in manufacturing, supplying and wholesaling a wide range of Transformer Packing Wooden Boxes. These are designed and developed using optimum quality wood and timber and extensively used for packing various types of materials. we provide these in various sizes, designs and colors as per the specific requirements of clients. besides, demands of these products are increasing day by day owing to its high load bearing capacity and reliability. We are Interested in queries from Rajasthan. 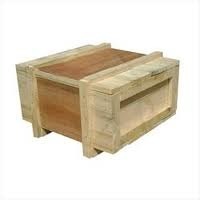 Our high class range of packaging products includes, Wooden Pallets, Plywood Pallets, Wooden Boxes, Wooden Crates, Wooden Packaging Boxes, BOM Wooden Pallets, Plywood, Packaging Boxes and MDF Press wood Pallets. We are approved force air treatment services provider as per guide line to meet the requirement of ISPM 15 certification.and offer the products as per the international quality standards. Entire products are tested on various quality parameters by quality controllers. These products are highly acknowledged for their efficiency and high performance. We cater to the individual needs of our clients and having all the efforts to hassle free delivery. Our company has a large and distribution network across all over the India. We manufacture a finest quality range of packaging products manufacture using high quality raw materials using sophisticated technologies. Our ideal infrastructure includes various machines for different operations. We are seeking queries mainly from Rajasthan.